In this section you will find some useful information on Ceramic tiles. Ceramic tiles are pretty much the most versatile and commonly used tile around. For one ceramic tiles offer the largest variety. Ceramic tiles come in just about every color and texture you can think of, and design and lay outs are only limited to your imagination. 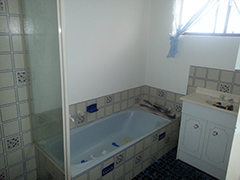 Ceramic tiles can be used in just about any area from light domestic to commercial/industry. They are an excellent choice for wet area's with the almost unlimited array of colors and styles. However some consideration must be taken when purchasing ceramic tiles because the tile you chose must be suitable for the intended area. Class 1 Floor areas that are only to be used with soft soled footwear or bare feet without contaminants such as dirt and grit (e.g.., domestic bathrooms and bedrooms without direct access from the outside). Class 2 Floor areas that are walked on with soft soled or normal footwear with, at the most, occasional small amount of dirt (e.g.., rooms in the living areas of homes, but the exception of kitchens, entrance ways and other rooms which may have a lot of traffic). Class 3 Floor areas that are walked on quite often with normal footwear and small amounts of dirt (e.g.., halls, kitchens, corridors, balconies, lobbies and terraces). Class 4 Floor areas that are subjected to considerable traffic OK with some contaminates such as dirt and grit (e.g.., entrances, work rooms, restaurants and exhibition and sales rooms as well as other rooms in public and private buildings not mentioned in Classes 1, 2, 3). Class 5 The maximum resistance achieved for glazed tiles against footwear traffic and resistant to staining agents. Specifically designed for heavy traffic commercial applications. Ceramic tiles are extremely durable in a domestic situation and are resistant to stains and household chemicals. They are easy to keep clean usually by sweeping and a mop, and have virtually no maintenance . Ceramic tiles are generally not affected by moisture and makes them perfect for areas such as shower alcoves and swimming pools. Ceramic tiles can be used on all wall applications from domestic though to commercial. However they are a glazed tile and are prone to chipping and glazing ware if the inappropriate tile is chosen.